During a sunset, mountain peaks lose sunlight later than areas around them. From a viewer observing a mountain, a shadow can appear ascending from the base to the peak. 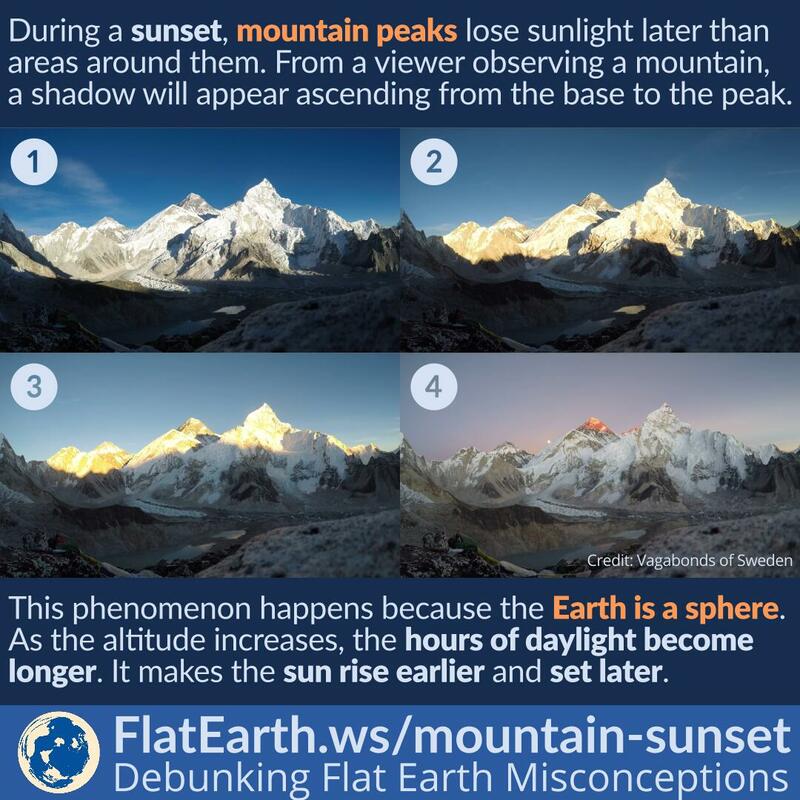 And conversely, during a sunrise, mountain peaks get sunlight before the areas around them and a shadow can appear descending from the peak to the base. This phenomenon occurs because the Earth is a sphere. As the altitude increases, the hours of daylight become longer. It makes the sun rise earlier and set later. 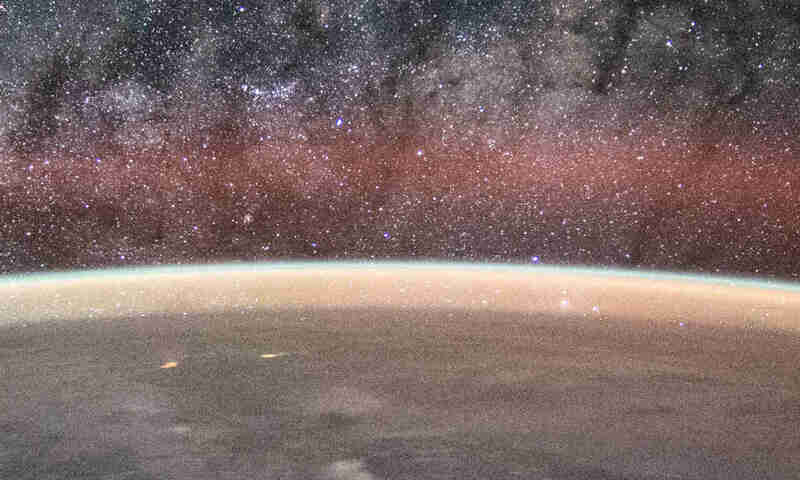 Earth’s atmosphere glows in blue because of Rayleigh scattering. It scatters sunlight to every direction. Bluish colors are scattered more than reddish colors. This results in the bright blue color of the sky in the daytime. 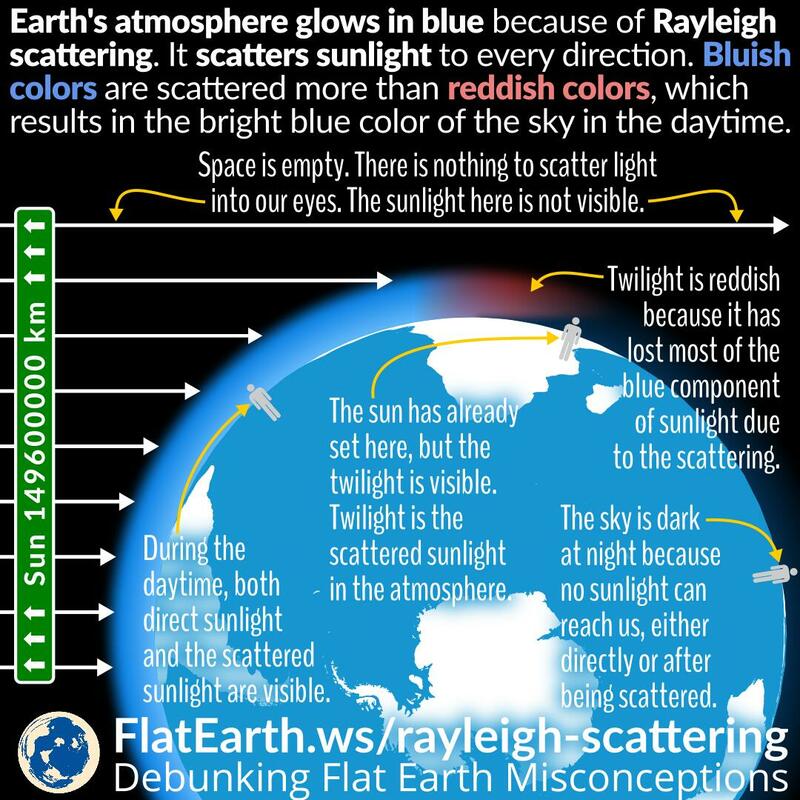 There are many misconceptions in the flat Earth community that arise from the lack of understanding of Rayleigh scattering. If the Earth were flat, then the Sun has to be visible above the horizon all the time, from the entire Earth. This does not occur, and the simple fact should have been sufficient to rule out any possibility of a flat-Earth. But instead, flat-Earthers invented various convoluted chain of ad-hoc hypotheses and presented them as “explanations” to prevent the flat-Earth model from being falsified. None of the “explanations” are proven nor correspond to the way our world works. In the Northern hemisphere, the Sun appears to move to the right. In the Southern hemisphere, it appears to move to the left. During sunrise and sunset, the path of the Sun forms an angle that roughly corresponds to the latitude of the observer. This phenomenon occurs because observers on the different locations on Earth’s surface is not standing on the same plane. 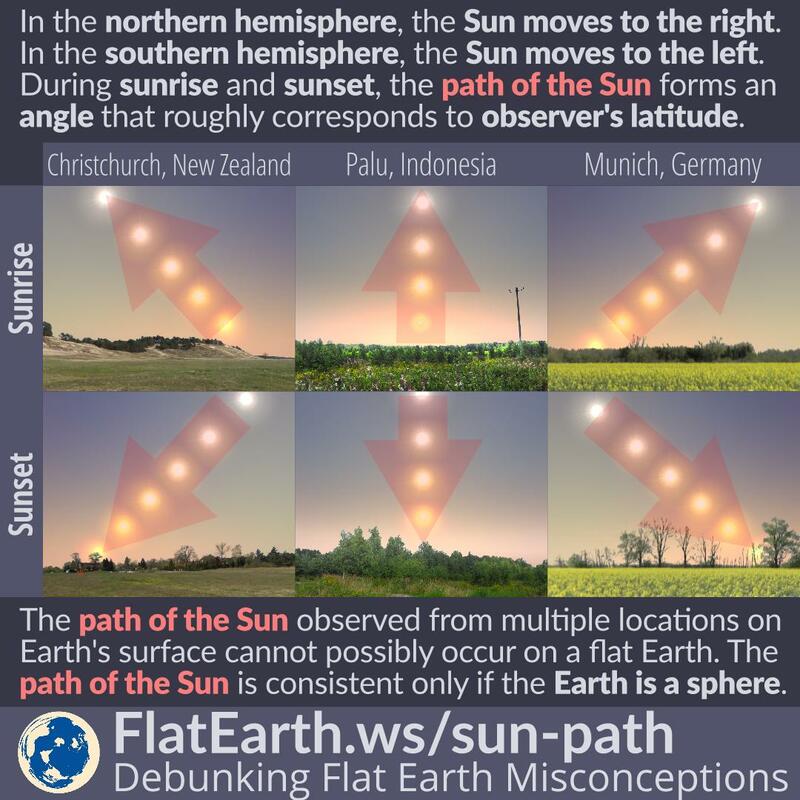 The path of the Sun observed from many different locations on Earth’s surface is evidence of spherical Earth. This observation cannot possibly occur on a flat Earth. There are videos showing the sun to appear to set, but after the camera is zoomed in, the sun is still above the horizon. The reason is that the camera’s autoexposure system is constantly adjusting the exposure, and in such scenes, there’s a difference in overall brightness before and after zooming in. 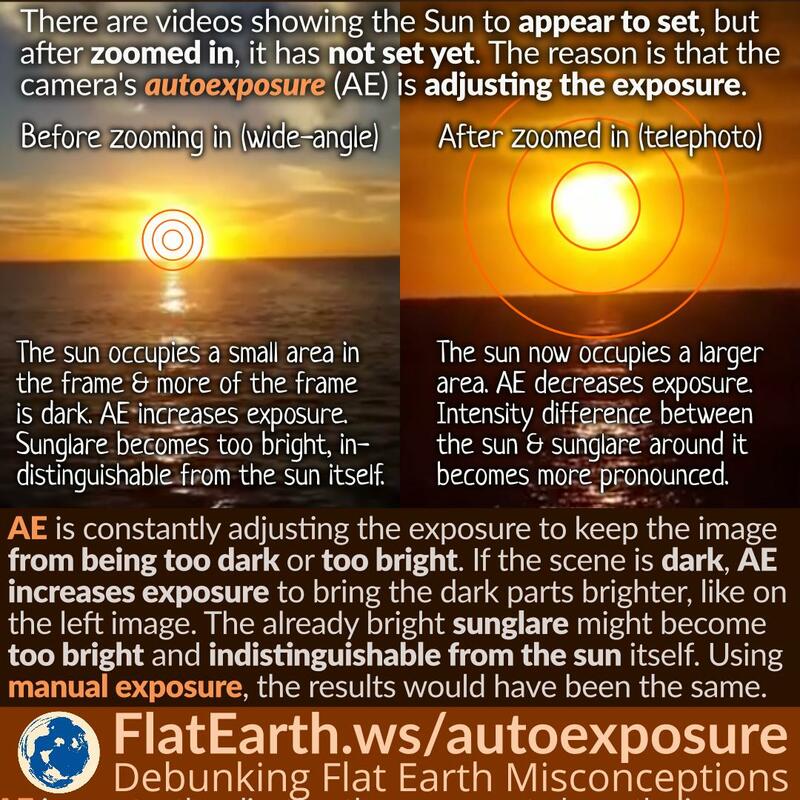 Flat-Earthers are taking such videos as ‘evidence’ of a receding sun. They are wrong. This is merely a matter of photography. In reality, the sun is not receding, and it has the same angular size throughout the day. 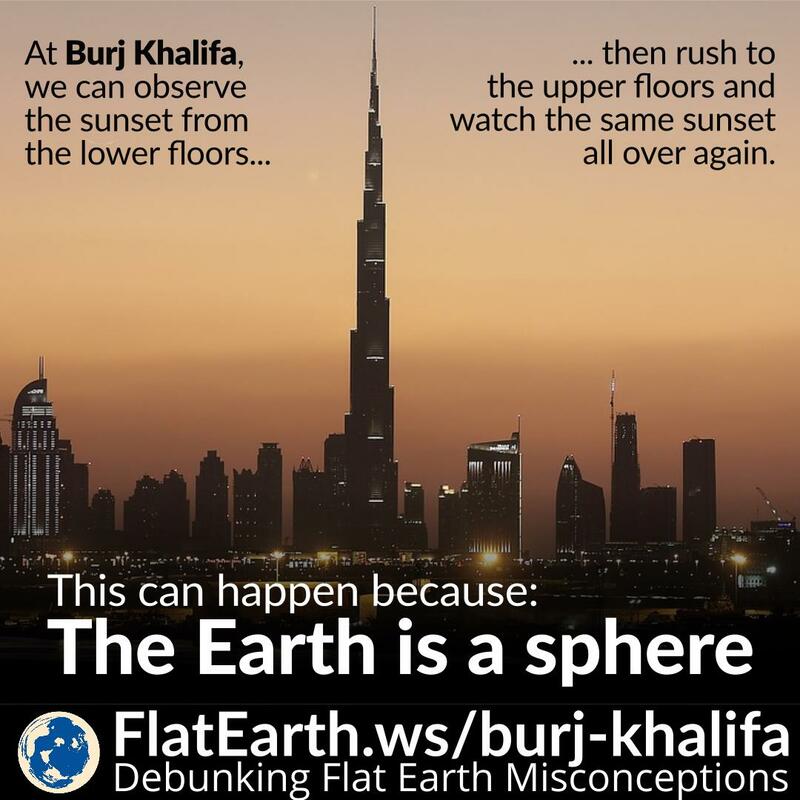 We often see flat-Earthers create a ‘miniaturized physical model’ of a real object and present them as ‘proof’ in support of flat-Earth and against spherical Earth. Their M.O. is to observe if the model remotely resembles the actual object in a particular way. If it does, then it is enough for them to conclude the model describe how the real object works. Conversely, if a real object cannot be miniaturized and still have the same behavior as the original object, they would conclude that the behavior of the original object doesn’t exist. 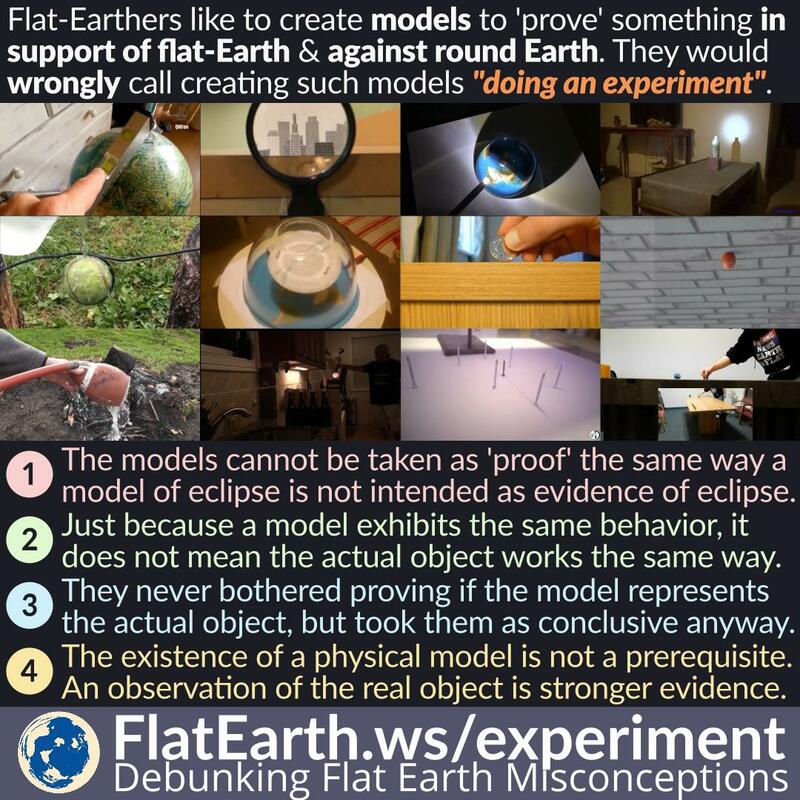 They would wrongly call creating such models “doing an experiment”. 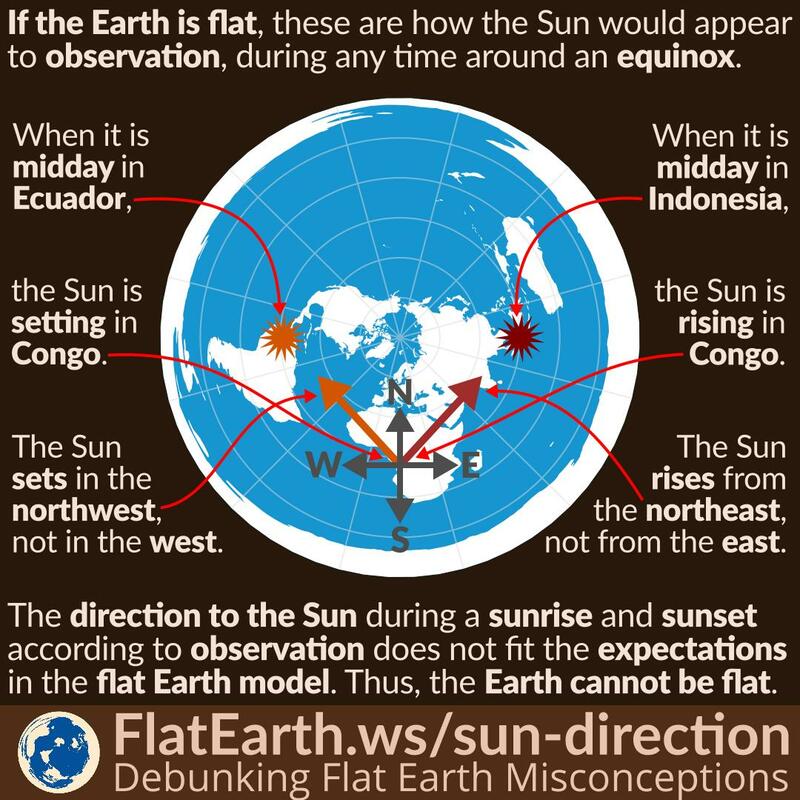 If we were to observe the direction to the Sun over the entire course of the day, on multiple locations on Earth’s surface, and then plot the results on the so-called flat-Earth map; then they would not consistently point to the position of the Sun that is calculated from its location on such map. This fact happens because the flat-Earth map is not the correct description of the real Earth. Before sunrise or after sunset, the Sun is below the horizon and not directly visible. But the sky and clouds above are illuminated because they are high above, and sunlight can reach them. If there’s a mountain between the Sun and the clouds, it can cast a shadow on the clouds. 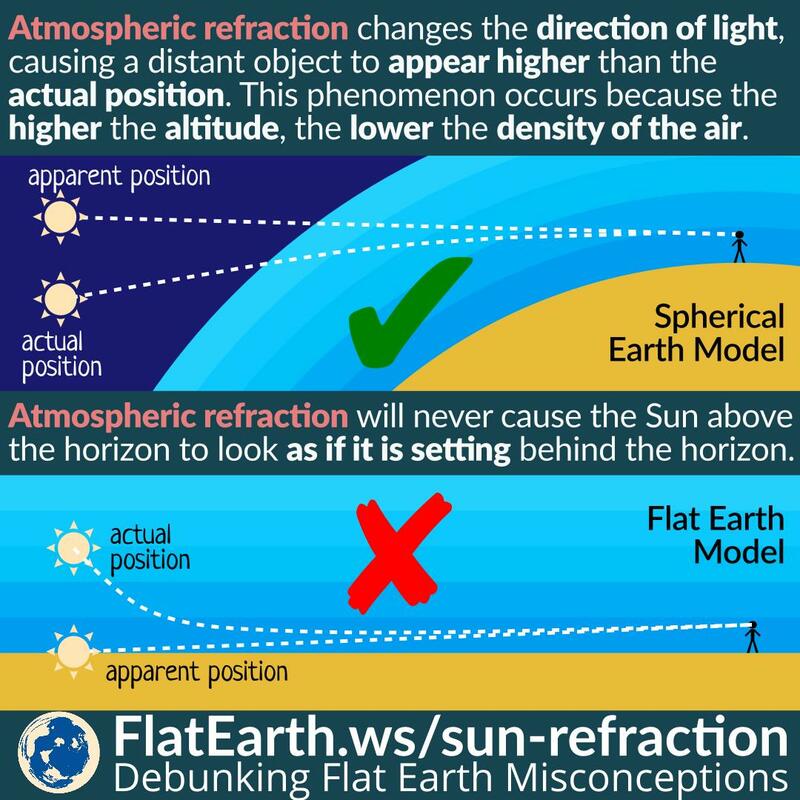 The flat-Earth model assumes the Sun is always high above, and thus, this phenomenon cannot possibly occur in a flat-Earth. 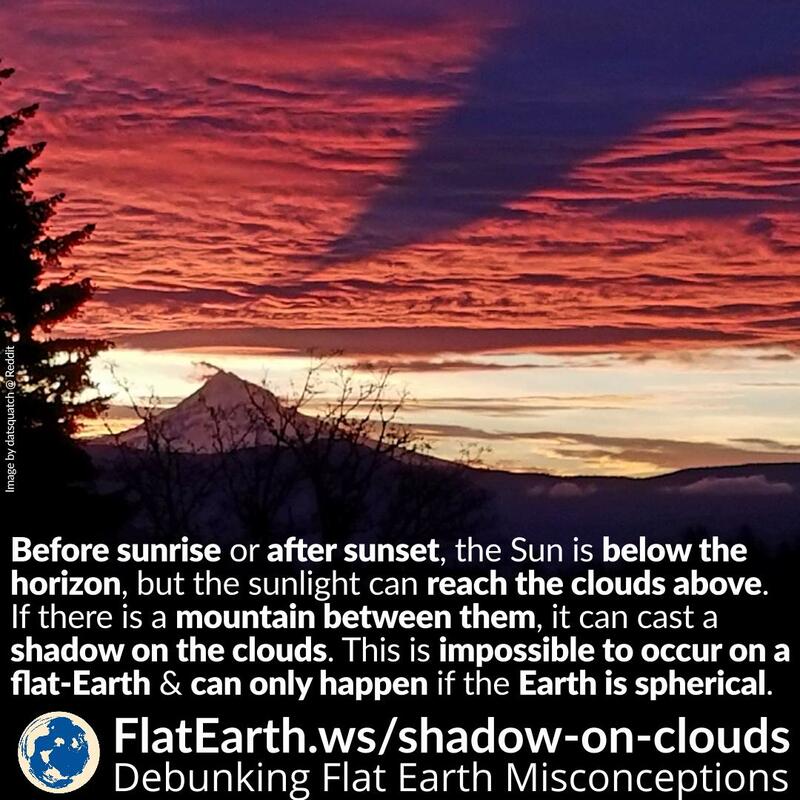 The fact that a mountain can cast its shadow on clouds far above it is evidence that the Earth is spherical. The December solstice occurs between the 20th and 22nd in December, which is when the Sun reaches its most southerly excursion. Around this time, the northern hemisphere experiences winter, and conversely, the southern hemisphere experiences summer. 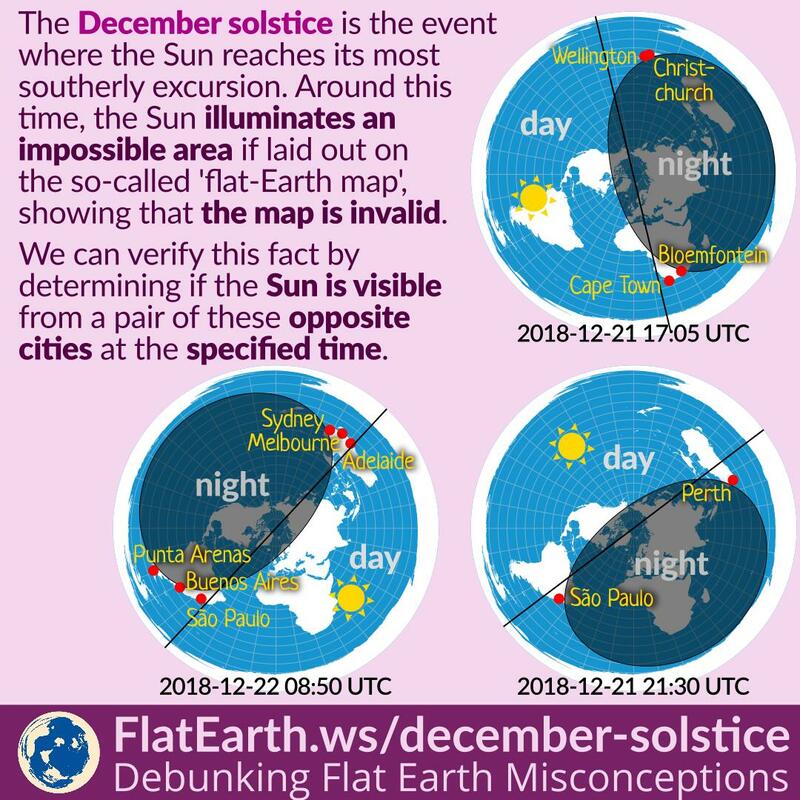 If we try to plot the areas that are having daytime and nighttime on the so-called ‘flat-Earth map,’ the Sun would appear to illuminate an impossible area, similar to Batman’s bat-signal. This fact tells us that the ‘flat-Earth map’ does not conform to reality. During the December solstice, on December 21, the Sun reaches its southernmost point. During this time, the northern parts of the Earth are experiencing the peak of winter, and conversely, the southern regions are experiencing the height of summer. 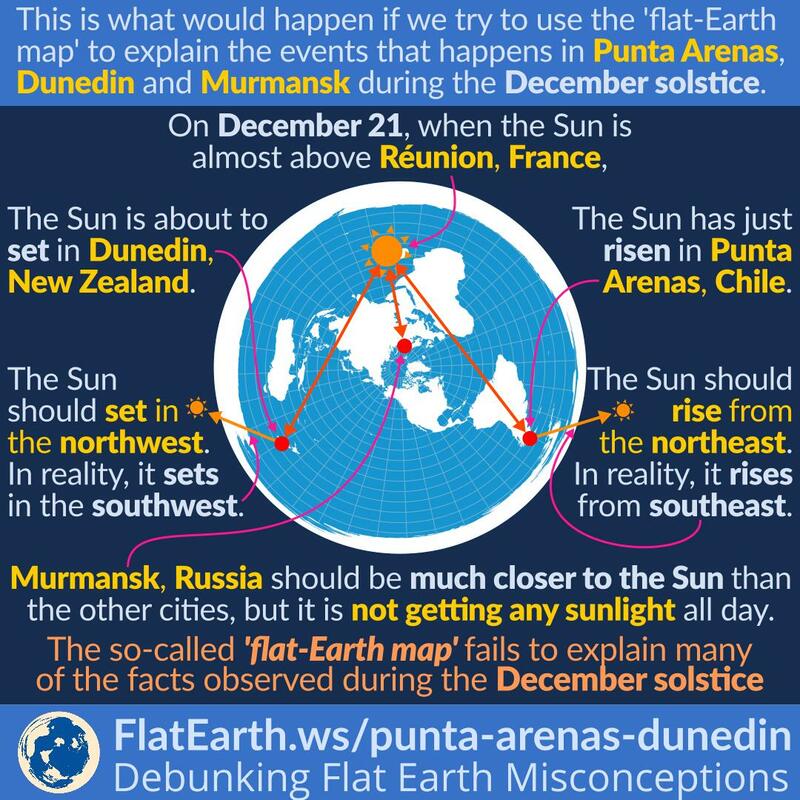 Most flat-Earth denominations picture the sun shining like a spotlight, and they can’t explain what is happening in the southern parts of the Earth during the December solstice. If the Earth is flat, then the Sun would have been visible from the entire Earth, but that’s not the reality. 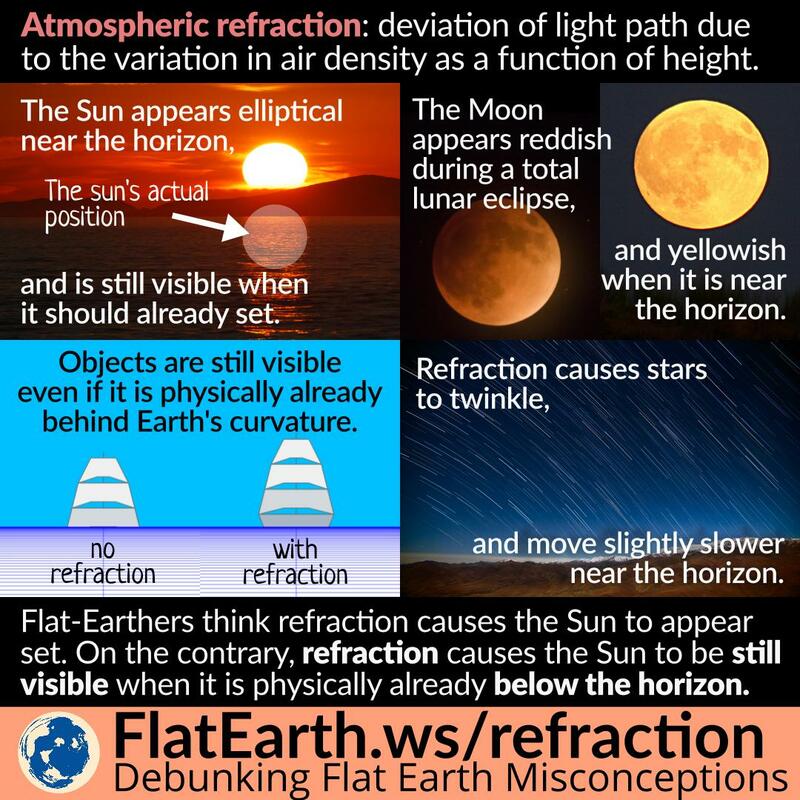 So, to rescue the concept of the flat-Earth from being falsified, they invented an ad-hoc hypothesis that the Sun appears to set because of perspective and refraction. Zooming in using a camera merely magnifies the center portion of the image. Changing zoom does not change an object’s position with respect to another object or the camera. It will not reveal more of a distant object. 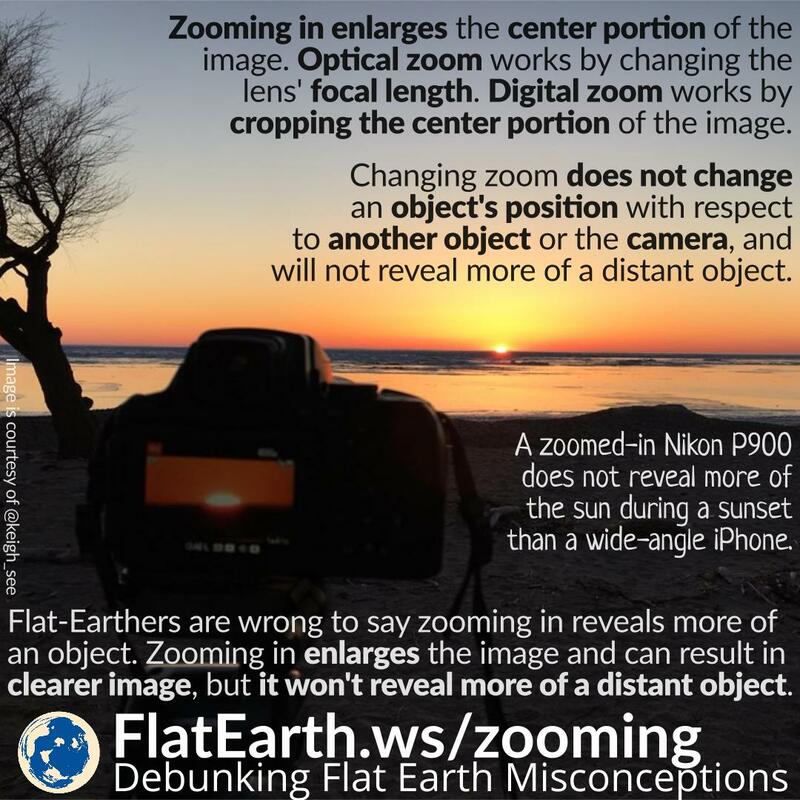 Flat-Earthers often claim that zooming in will reveal distant objects that are ‘allegedly’ behind the curvature. They are wrong. If the object is really behind the curvature, then no amount of zooming can bring the object back into view. Light waves are not always moving in a straight line. When it passes through a medium of a different refractive index, the waves will deviate. The phenomenon is called refraction and described according to Snell’s Law. Earth’s atmosphere has variation in air density that depends on the altitude. As the refractive index changes with the density of the medium, light waves passing through Earth’s atmosphere also experience refraction. 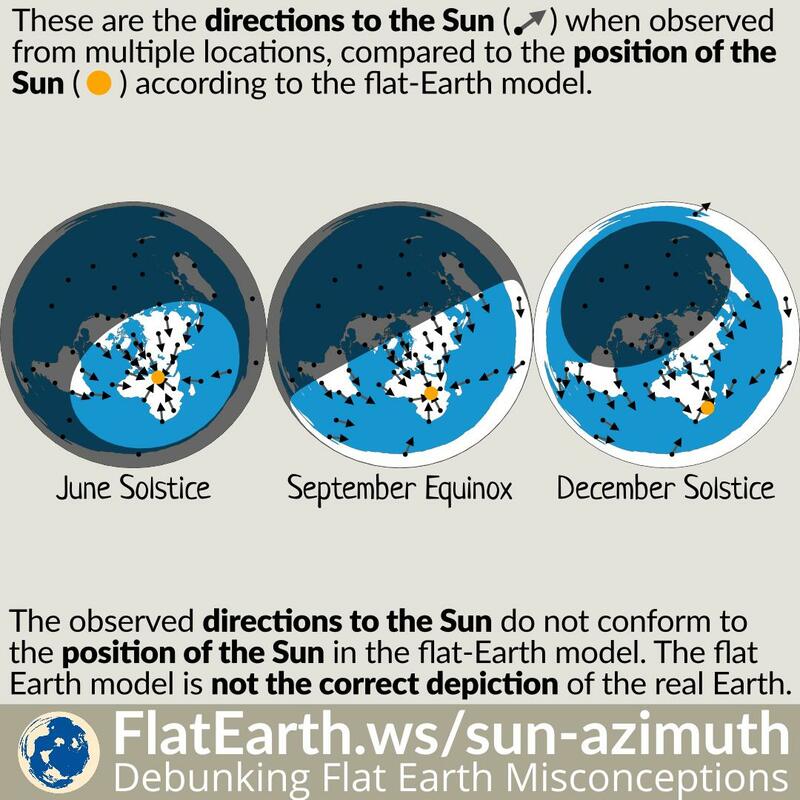 One of the major holes in the flat-Earth model is the apparent motion of the Sun. The sun rises and sets once a day. But if the Earth is flat, then sunrises and sunsets should never happen, and the Sun would be visible all the time, from anywhere on Earth. 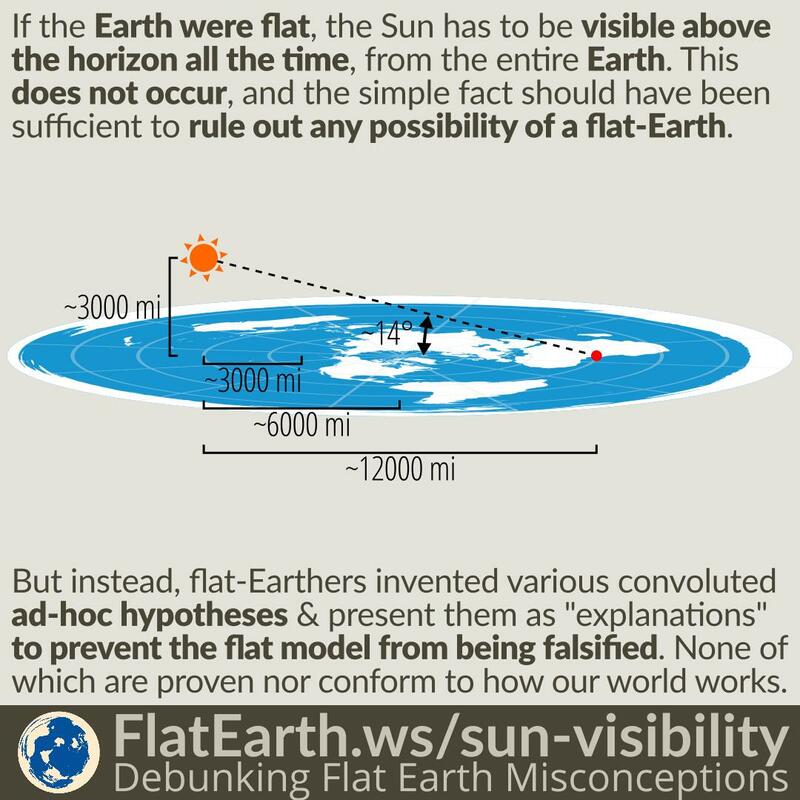 In order to plug the hole and ‘explain’ this problem, they invented an ad-hoc hypothesis that the Sun sets because of perspective. The pretext is that an object appears closer to the horizon as it is moving away from the observer. 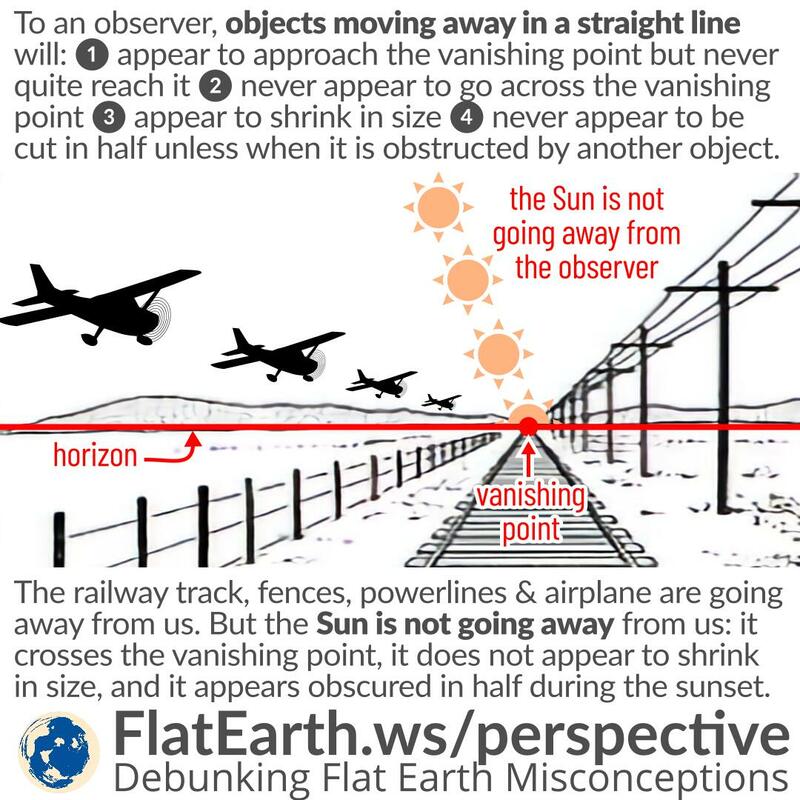 They extrapolated this fact and wrongly assume that if it keeps going, then eventually it will appear to go down crossing the horizon line and is no longer visible. Some flat-Earthers observed the Sun and Moon appear at the same time during a total lunar eclipse. Predictably enough, they pick the most far-fetched explanation, and conclude the Earth is not round. But in reality, this phenomenon is well documented and clearly explained. We know for granted that during an equinox, the Sun rises from the east and sets in the west. Such facts are undisputed and have been verified through centuries of observation. The flat-Earth model, however, is unable to accommodate this simple fact. And thus, it is not hard to conclude that the flat-Earth model does not represent reality. Having the total height of about 830m, Burj Khalifa is the tallest building in the world. It is so tall that we can observe the sunset at the base of the building, then rush to the upper floors and watch the same sunset again for the second time on the same day. This phenomenon can only happen if the Earth is a sphere. On a higher position, we will observe the sunset later than when we are closer to the ground.